United Left needs a resounding endorsement, shouted loud and clear from the streets, if radical change in Spain is to have a fighting chance. In the November 2011 general elections, six months after Spaniards occupied town squares across the country, including famously Madrid’s Plaza del Sol, the forces of reaction were projected into government. The Socialists had been punished at the polls for imposing austerity on their core constituency – workers – even as the bankers, who were behind a property bubble that catastrophically burst, seemingly got off scott free. But Spanish voters got something much worse. Even if Mariano Rajoy and his Popular Party did their best to mask their plans ahead of the vote, once in government they rapidly accelerated these same self-defeating policies, leading to today’s six million unemployed, collapsing public services, rising poverty and an authoritarian turn designed to crush opposition in the streets. The radical United Left, on the other hand, while increasing its share of the vote, with 1.7 million votes, still trailed third by a long way – despite standing on a platform that matched very closely the indignados’ objectives: that is, social justice, jobs, affordable housing, tough action against the bankers and fundamental reforms to the political system that would return power to ordinary people and their communities. The good news today is that the United Left is now at 16.6 per cent in the polls. That’s a gain for the communist-led formation of ten points since the general election. And, according to pollsters Metroscopia, it has closed much of the gap with the two main parties: the party led by Cayo Lara is now just under four points shy of the Socialists, and six points below the Popular Party. Since they were booted from power, the Socialists’ fortunes have gone from bad to worse. To blame is not only its legacy in power, but a weak leadership that fears the rage of the rabble and cannot resist offering a bipartisan hand to the most right-wing government Spain has seen since Franco. The Popular Party’s poll standing has collapsed even more radically, albeit from a higher point. Even Rajoy’s own core supporters are turning their backs on the party. They are unforgiving about a string of broken promises, one of the most scandalous of which for the conservative constituency was not to increase taxes, which Rajoy then proceeded to impose on the majority of citizens, in order to plug the gaping hole in the public finances caused by austerity-induced recession, and to gain grace in foreign capitals for a 100 billion euro EU cheque for Spanish banks. The sustained level of popular mobilisation against Rajoy is in itself an astonishing feat. Whether around the issue of home evictions (a quarter of a million and counting), union-led protest ‘tides’ rising against cuts and privatisation in education and health, and campaigning in defence of women’s rights, the determination and tenacity of the protest movement is something the Spanish should be rightly proud of. But it is also not something that can be counted on indefinitely. What would really make for a real celebration on this important anniversary would be for a shift in gear, beyond opposition to a confrontation with a regime that, it is all too clear, will never be responsive to popular demands. 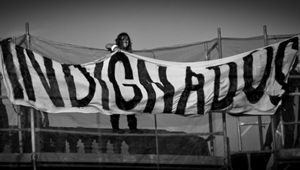 It may be only two years old, but it is time that the indignados movement grew up, politically-speaking. And unlike many places in the world, this doesn’t have to involve painful compromises. Spain actually has a serious political party that’s on the side of the people, one with deep roots in the labour movement and a track record of openness to civil society and social movements. It is clearly capturing the public imagination. But United Left needs a resounding endorsement, shouted loud and clear from the streets, if radical change in Spain is to have a fighting chance.